It’s been a long time since I have posted a photograph. I’ve been spending so much time delving into digital art that it’s taking up maximum of my available time. But today I thought let’s keep it aside and go back to that which actually made me get into photo editing to Photoshop to digital art. I did some shots last month at Pondicherry with my relatives and also some with an old friend at Alamparai. I opened those archives and started sorting the photographs. This bunch should keep me coming back to editing for sometime. However, for now here’s a picture from my recent trip to Alamparai fort. It was a 3 hour bike ride up and 3 down, which means I rode up to 6 hours that day. We started off at 4 in the morning from Adyar and reached Alamparai around 7am. We took a boat ride to the fort. I shot this after docking at the fort. The shores of Alamparai fort. Order a Limited Edition Print of this image. I love this ability of taking something not so special and turning into something which, at least closely, can be related to art. This picture for example. You wouldn’t beleive me if I said that this one here is the original shot. I took this with my Nikon L120. Yes, I’m not kidding. This is the original. To this, I add these simple steps. I corrected the horizon using the using the ruler tool with the horizon of the shore as reference. Then I cropped out the unwanted areas using the crop tool. Crop tool is easy. 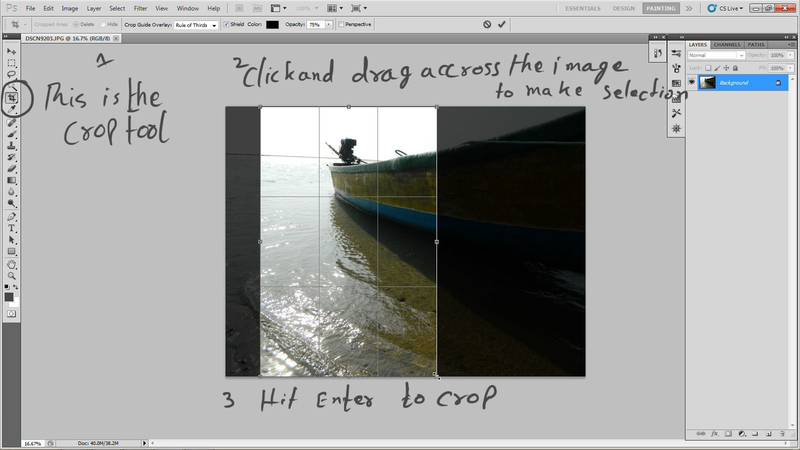 Click on the crop tool icon, click and drag across the image to make selection, hit enter. Then the rest of the magic is done in Nik Silver Efex. 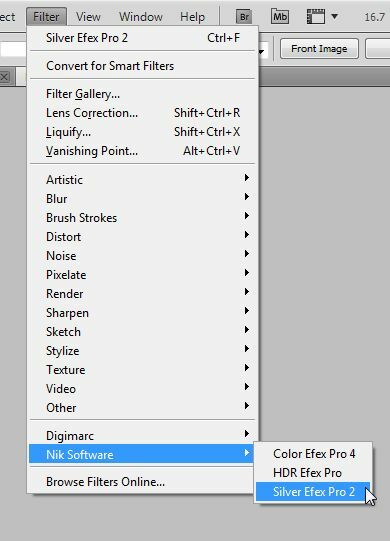 Navigate to this plugin from this menu. Then apply these changes to from the right hand side menu in the plugin. Hit the ok button at the bottom right corner of the window and you’re done. Actually, these are the steps that make up 90% of my black and white processing technique. Click on the link to learn about it in detail. You can see that there’s almost nothing that I have done here. Just cropping, and simple tweaks in a plugin, to make ordinary look extraordinary. Gracias por tutorial, muy buena tu foto!! Welcome back, photographer! You have been missed. Hi alessandro!! Glad to hear from you too in a long time. I guess I’m at the point of being a jack of all trades. And yes, I agree. In today’s digital era, and with audience becoming more and more sophisticated one can’t depend on camera alone.